Green Party nominee Jill Stein will receive $2 million in refunds after initial estimates were well above the final costs of the failed presidential recount attempts in three battleground states, according to officials. 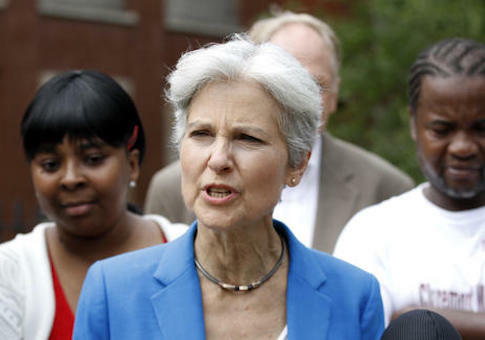 Stein will use the leftover funds to launch a new voter integrity group. Stein, who pushed for recounts in Wisconsin, Pennsylvania, and Michigan, was only successful in initiating a recount in Wisconsin, an effort that ultimately netted 131 more votes for President-elect Donald Trump. Federal courts in Pennsylvania and Michigan halted Stein's attempted recounts in the states. Wisconsin initially estimated that the effort would cost $3.5 million. A spokesman for the Wisconsin Elections Commission told the Washington Free Beacon on Tuesday that the final costs for 70 of the 72 counties in the state was $1.8 million. With the remaining two counties, the total costs could hit $2 million, the spokesman said. Stein would be reimbursed the remaining $1.5 million. Stein will also receive hundreds of thousands in reimbursements for the failed recount attempt in Michigan. Stein paid in full for Michigan's 7,786 precincts at a rate of $125 per precinct, according to a spokesperson for Michigan's Department of State. Recounts were completed in 3,050 of the state's 7,786 precincts before being stopped by the courts. Stein will receive a refund for the remaining 4,736 precincts totaling $592,000. Stein, whose team did not return numerous requests for comment, announced that the remaining funds go towards her continued "fight for election integrity." At a rally in Madison, Wis., on Tuesday, Stein knocked the state's recount and said that the remaining money will go toward launching a group called Count My Vote. "When we asked for a full recount we only got a hand recount in about half of the precincts for about half of the voters," she said. "So essentially what we got was half a recount." Stein said that Count My Vote would review the Wisconsin recount and release a report within weeks, Wisconsin Public Radio reported. "We also want to include in this ensuring we have a right to vote and that we put an end to voter ID laws to this interstate cross check that has taken millions of voters potentially off rolls, also ranked choice voting," she added. Stein raised a total of $7.3 million on the failed recount efforts and spent nearly $1 million of the funds on consultants, staff, and administrative expenses, the Free Beacon previously reported. A line item of expenses on Stein's website claimed that staff was paid $212,500 while consultants were given $364,000. Administrative expenses, such as travel costs, cost $353,618. The breakdown of expenses has since been removed from the site. Republicans have criticized Stein's efforts. President-elect Donald Trump referred to the efforts as a "scam." Speaker of the House Paul Ryan called the efforts a "ridiculous fundraising and publicity stunt." This entry was posted in Politics and tagged Jill Stein. Bookmark the permalink.